“In the late 1960’s, Dow Corning Corporation, the largest supplier of silicone and silane chemicals in the world, began a pure research program to determine if they could utilize silanes as a way to keep pesticides from volatilizing or migrating into the environment. If they the outcome would be safer, more efficient and more effective products. A large variety of formulations were tested, including a host of herbicides, insecticides, fungicides and bactericides. The body of work created volumes of information and empirical data that supported the efficacy and safety of their discoveries. That work became the foundation of numerous patents and accolades from the scientific community including the IR-100 Award. I received all three of Tile Doctor Shield‘s products to review. 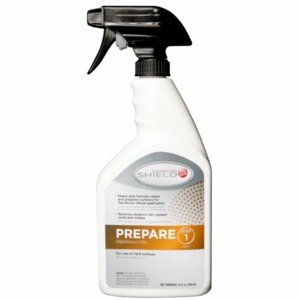 The first step was “Prepare” – this heavy duty formula cleans and prepares surfaces for Tile Doctor Shield Application. It contains eco-friendly, award-winning cleaning solution! This is for use on hard surfaces only. I have tile walls in my shower, and they aren’t exactly as clean as they should be. So, I was more than thrilled to try this out! 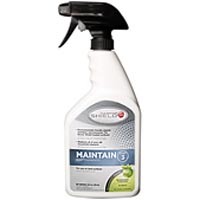 It removes stubborn dirt, grease, mold and mildew that other cleaning products simply can’t! The Prepare step did what it says, it prepares the tile to be thoroughly cleaned. The next step, Shield, provides freshness and combats deterioration and discoloration. It is effective against mold, mildew, algae and odor-causing bacteria. It can be used as a final bacteriostatic finish on the following items to impart bacteriostatic/fungistatic (mold and mildew) activity: carpet, draperies, upholstery, furniture…and non-food contact hard surfaces including: floors and floor coverings, natural stone, ceramic and non-ceramic tile, walls and wall coverings, ceilings, concrete, chrome, stainless steel, fiberglass, vinyl, porcelain, wood, glass fixtures and aluminum. This is so easy to use! It keeps surfaces cleaner much longer than other cleaning products do. It contains no arsenic, heavy metals or polychlorinated phenols. More than thirty years of safe and effective use! It kills microorganisms really quick. The last step, Maintain, will replace all of your old household cleaners! 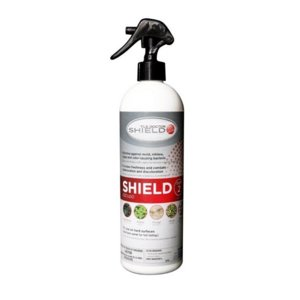 It is an environmentally friendly cleaner that maintains and preserves Tile Doctor Shield treated surfaces. It has biodegradable components. NO bleach and NO toxins or poisons. You can purchase the above products from Alice.com or Floor and Decor Outlets. You can follow Tile Doctor Shield on Twitter! You can also “like” them on Facebook, where you can be eligible to win a set of products. Disclaimer: I received the above product(s) from Tile Doctor Shield free of charge in exchange for an honest review. No other compensation was received. However, all opinions are strictly my own. I just Liked them on Facebook! This sounds great to me- we have a recurring problem with mildew around the insides of our windows and I am so hoping that this product could finally be the cure to that. Wintertime is the worst for it at our house. Happy to have been introduced to another potentially great product! thanks for the review! I'll definitely have to check them out. Going Back to School in Style with Hello Kitty and Mabel’s Labels!